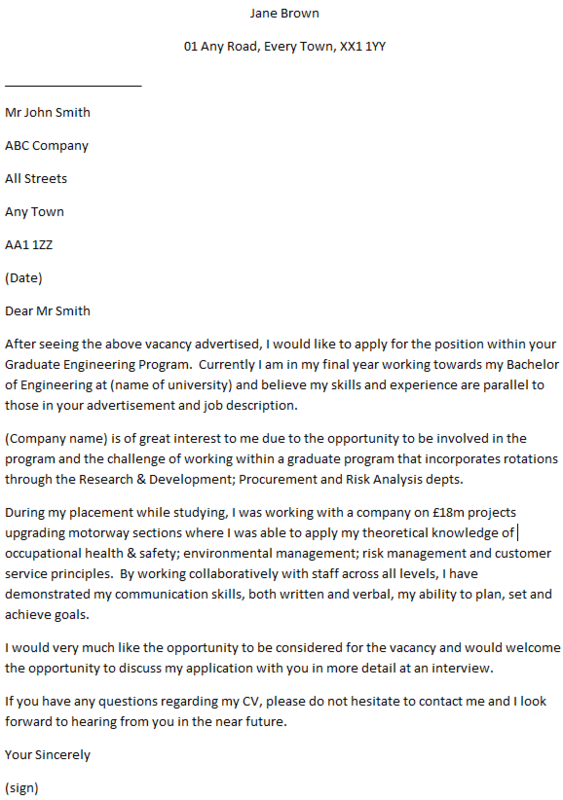 Cover letter example for a Graduate Engineer job. You can amend this letter as suitable and apply for latest job vacancies. I should like to apply for the role of Graduate Engineer as advertised recently. I have Mechanical Engineering degree (2.1 Hons) including working with CAD and Solidworks and learning C/C++ programming skills. I am looking for a role where I can help make a real impact in the business and am ready to make the next step into a career building role. As such I would like to work for an organisation where I can be given the opportunity to expand my knowledge of design and the theoretical knowledge of Lean Manufacturing and apply it to real life situations. I have previous experience of working in a System on Chip (SoC) environment during a summer internship at an aerospace manufacturer based in Bristol, where I gained a good understanding of System on Chip design and implementation flow. I am very willing to relocate as I am keen to gain a full-time position working within an Engineering department using the above skills and capabilities. I am able to hit the ground running and work directly with leading engineers so that I can gain further hands on experience. I am flexible, and adaptable, and able to pick ideas up quickly and take action, under instruction, and meet project objectives and deliverables. After seeing the above vacancy advertised, I would like to apply for the position within your Graduate Engineering Program. Currently I am in my final year working towards my Bachelor of Engineering at (name of university) and believe my skills and experience are parallel to those in your advertisement and job description. (Company name) is of great interest to me due to the opportunity to be involved in the program and the challenge of working within a graduate program that incorporates rotations through the Research & Development; Procurement and Risk Analysis depts. During my placement while studying, I was working with a company on £18m projects upgrading motorway sections where I was able to apply my theoretical knowledge of occupational health & safety; environmental management; risk management and customer service principles. By working collaboratively with staff across all levels, I have demonstrated my communication skills, both written and verbal, my ability to plan, set and achieve goals. I would very much like the opportunity to be considered for the vacancy and would welcome the opportunity to discuss my application with you in more detail at an interview. If you have any questions regarding my CV, please do not hesitate to contact me and I look forward to hearing from you in the near future.